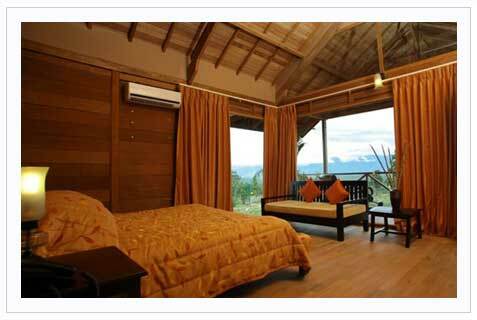 Cicada Bandipur, unlike any other resort in the region, is situated very close to the Bandipur National Park. Bandipur as you know, teems with wildlife, and provides a safe haven to a wide swathe of wildlife, which includes the Four horned Antelope, Gaur, Asiatic Elephant, Leopard, Striped Hyena, Sloth bear, the Crocodile, Mouse deer, and a host of bird species like the Barbet, Babbler, Warbler and the Indian Peafowl. And because Cicada-Bandipur rubs shoulders with the National Park, it provides for an experience quite unlike anything you've ever experienced. It isn't uncommon to hear the calls of animals and the trumpeting of elephants as they pass by the resort. Moreover, we aim to enhance the experience in just a little while; when we hope animals will stop by at the water-hole and salt lick that's right within the resort itself. Already large herds of Cheetal have been spotted near the water-hole and we are expecting the other species to also join in to enhance your experience. Among other things, Cicada-Bandipur offers a panoramic breathtaking view of the magnificent Nilgiris. Look out of your bedroom and you’ll be presented with a perpetually changing view of the Nilgiris. One moment it’s misty, the other it’s shrouded in shadows. Then when you least expect it, it’s jaw-droppingly spectacular. While soaking in the view is an activity in itself, you'll see that the list of things to do is limited only by the time you have. Tariff Valid from 1st Jan 2009 to 15th September 2009.